Windows Vista has a packaged built-in Aurora wallpaper style (if indeed it’s a feature, and not a bug) startup screen or boot logo image. The visual effect for the Aurora startup image on boot up is beautiful, instead of a simple black background screen with progress indication bar. 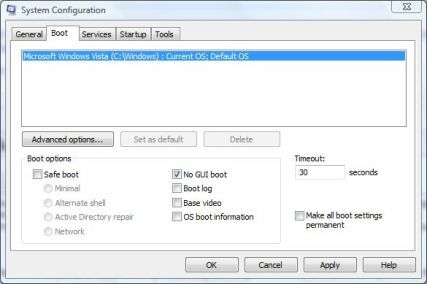 If you want to try out the new startup screen, use the trick below to enable the different Aurora startup boot screen. Click on Start Menu, or press “Win + R” keys, and type MSConfig in the Start Search or Open text field, then press “Enter”. In the “System Configuration” window, click on Boot tab. Tick and check the No GUI boot option. Click on Restart button when asked whether to restart the computer to apply these changes to reboot the PC. If you select “Exit without Restart”, restart the system manually. When the system boots up again, the original scrolling progress bar will change into Aurora background screen, with a white text saying Windows Vista is starting. If you do not like or unsatisfactory with the new startup screen, simply follow steps above to revert back the setting (i.e. uncheck the “No GUI boot” option).